I always double or triple a recipe when I’m cooking savoury dishes, so that I can guarantee there’s leftovers for a rainy day, or busy weekday night. I read recipes that call for 500gms of this or 1 chicken breast for that and think, yep, that’d feed one person in my house. I can be found defrosting 2kgs of mince and cooking it all up in one go, comforted that after a tough day in the office and with the 3yr old screaming at me to be fed, rushing to get Tweenie out to some evening activity, I can have something yum and filling on the table quickly. 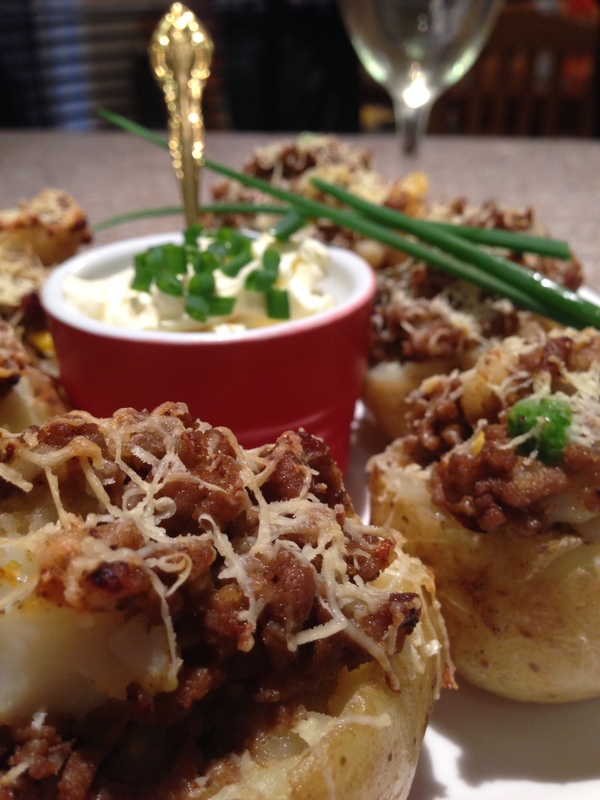 One of those meals last night, was stuffed potatoes with taco mince filling. Really, who can resist a cheesy, mexican spiced, stuffed to the brim, oven baked potato? I haven’t had stuffed spuds in years. I remember in my early, much skinnier, childfree days I would bake a potato, fry off some bacon and onion and pile the steaming spud up with bacon, onion, cheese, sour cream, butter, chives and hot corn. Oh My! Yum! Think I’ll save that recipe for an indulgent treat when I’m feeling a bit down, and have no one else to share it with. 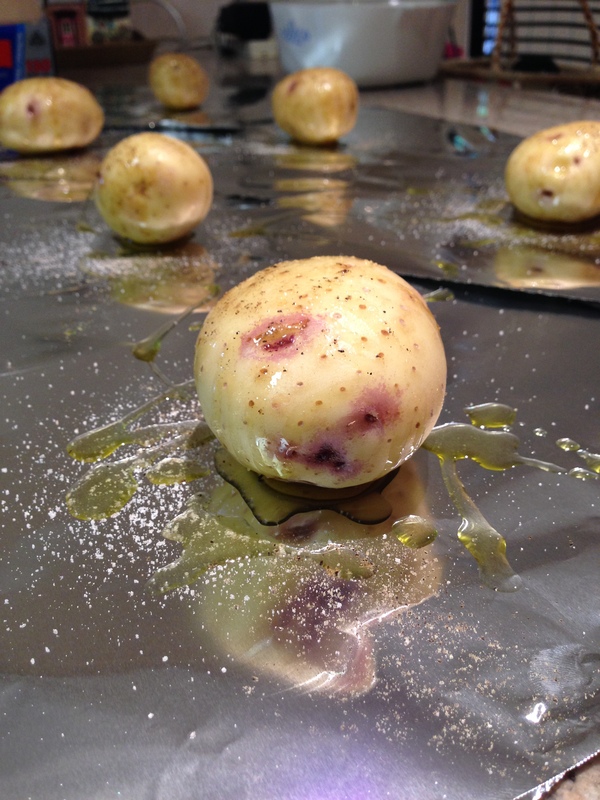 Put the spuds onto squares of alfoil, drizzle over some olive oil and season well with salt and pepper. Wrap up and bake at about 180 for as long as it takes to get the spuds soft. Mine took about 50 minutes for 6 spuds. When they’ve cooled down enough to handle, slice the tops off. Note Buddy in the background who ate 4 lids. Keep the tops for presentation, or let your children eat the warm, crispy, tasty pieces as a pre-dinner treat. 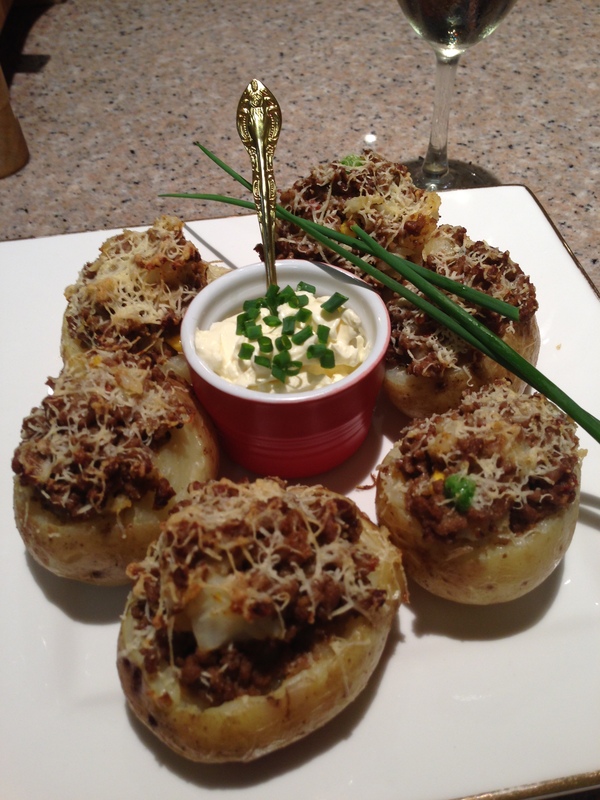 Gently scoop out the potato so you have a shell that is still stable enough to take the filling without collapsing. 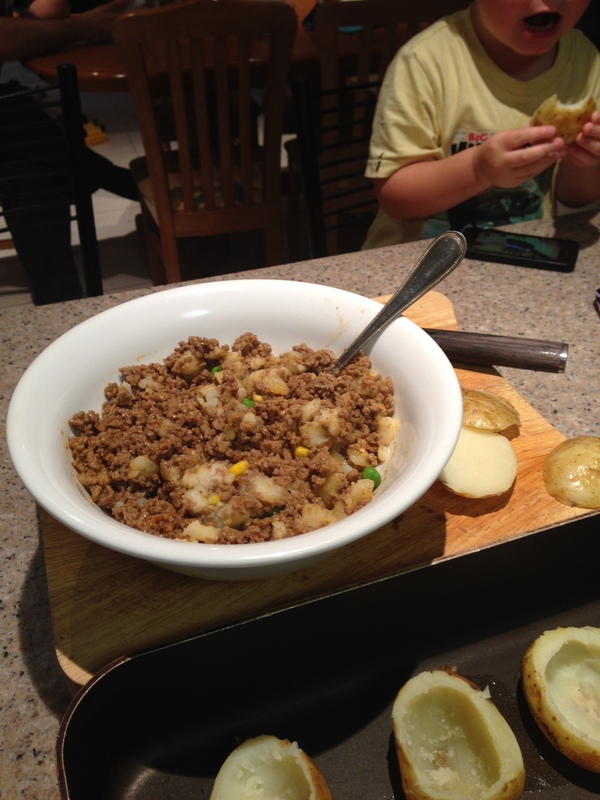 Mix the potato in with the taco mince. I had some peas n corn leftover so chucked it in there too to satisfy SO’s need for vegies and spoon it generously back into the potatoes. 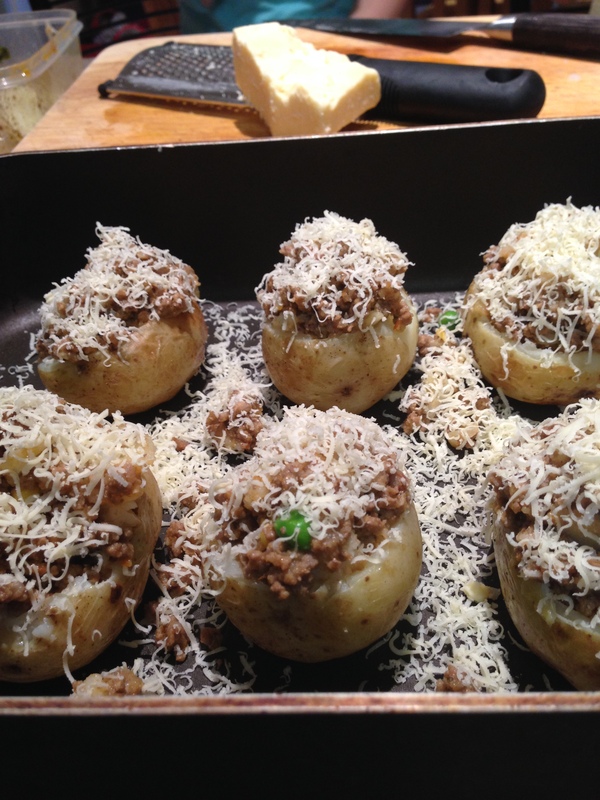 Grate a little or a lot of tasty cheese over the filled spuds and put them back into the oven. Bake until they’re cheesy, gooey and hot. Serve with sour cream and chives. I thought I had some coriander but didn’t, which is a shame as that would’ve have made the dish even more delicious. These will be on the menu more often. Seriously good food. Next Post The Girls and my herbs. Beetroot, hmmm, that sounds a little different. In fact, sounds like a hamburger with the lot in a potato!